Bitter melon is available at most Asian markets from spring through autumn. Choose melons that are firm, unblemished and 15 to 30 cm in length. Pale green melons with shallow grooves that are widely spaced are milder in flavour; deeply grooved, dark green ones are more intense (we like these). Wash the melons, cut each in half and scrape the insides clean with a spoon. Try to remove all of the white membrane. Cut the melon into pieces. 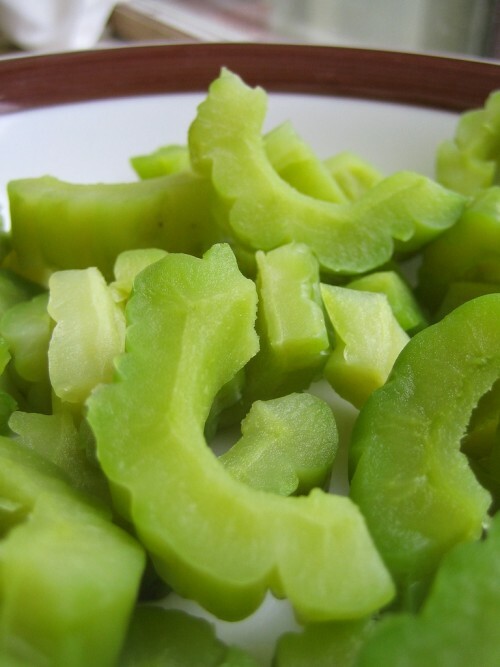 Boil the melon pieces in water until they begin to soften. Cut the beef into strips and marinate in soy sauce, sugar, cooking wine and cornstarch. Prepare the stir-frying condiments next. Soak the black beans in hot water for a few minutes then drain. Chop the ginger and shallots into small pieces. 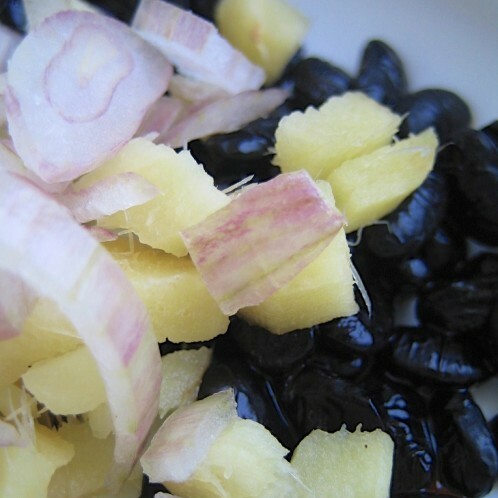 Throw half of the ginger, shallots and black beans into a hot wok with some oil. 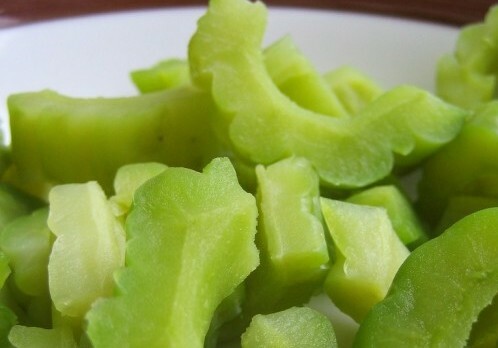 Add the bitter melon and taste after a minute. If the melon is extremely bitter, add a dash of sugar. When cooked, spoon out into a dish. Throw the rest of the ginger, shallots and black beans into the wok with the beef. 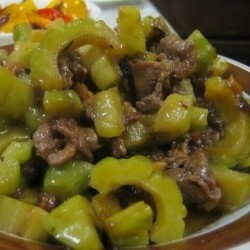 Cook for several minutes until the beef is almost done, then return the bitter melon to the wok. Add the oyster sauce and stir well. Add salt to taste. This entry was posted in meat, recipe, veg. Bookmark the permalink.